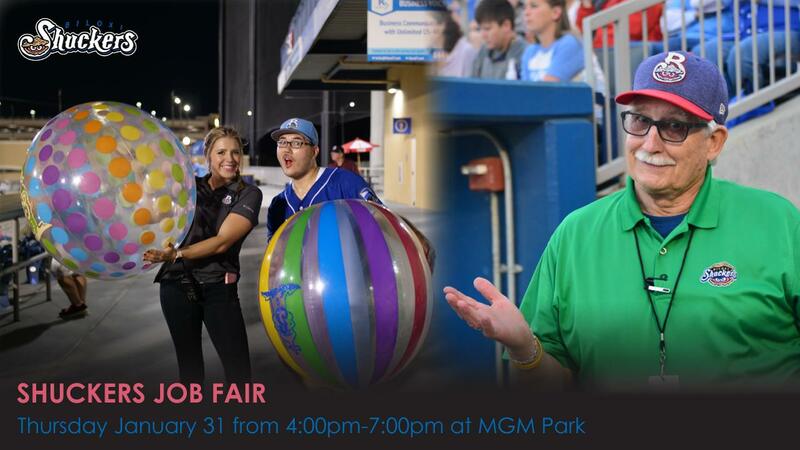 The Biloxi Shuckers will host their fifth annual job fair on Thursday, January 31 at MGM Park in the home clubhouse from 4-7 pm. The Shuckers are looking for qualified, hardworking candidates, with an emphasis on customer service skills who want to help provide fun, family entertainment for our guests. Spectra Food Services, the official concessionaire of MGM Park, will also be conducting interviews. A variety of seasonal positions are available and vary based upon skill set. The Shuckers are seeking staff that can work all home games and additional events as needed at MGM Park. Most games are held in the evening hours during the week and weekend. Candidates must be able to accommodate the schedule, stand for long periods of time and must be able to work outdoors. Interviews will be conducted on a first-come, first serve basis. Applicants are encouraged to bring a resume and dress for a job interview. Applicants that arrive prior to 7:00 pm will be guaranteed an interview. The Biloxi Shuckers staff will conduct interviews with each applicant. Secondary interviews will be scheduled for February and March. Those that wish to apply may view and print the 2019 job application here or by visiting biloxishuckers.com and clicking on 'Job Application' under the 'Club Info' tab. The complete 2019 Biloxi Shuckers schedule is available here. Shuck Nation memberships and group outings for the 2019 Biloxi Shuckers season are on sale now and are available for purchase by calling (228) 233-3465, online at biloxishuckers.com or by visiting the MGM Park front office at 105 Caillavet Street in Biloxi. The Shuckers will open their fifth season at MGM Park against the Birmingham Barons on Thursday, April 4.